The team manager needs to be registered with Equestrian Entries (many would be if they are riders) and ensure their contact details, including their cell phone number are correct. Every team member must be registered with Equestrian Entries AND have the competing horse assigned to their account. Will have one if they have entered any event using Equestrian Entries, even if they didn’t enter online. The team manager logs onto the Equestrian Entries website. A popup may show up to select either an individual entry or a team entry (select team). Press the save button and you should see something as below. 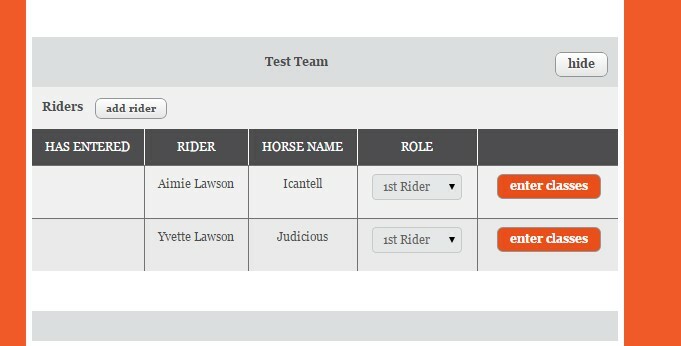 Press the Enter/View Riders button and the next section will appear where you can add in your team riders. Press the Add Rider button and a search popup will appear. Type in the first few letters of the surname and all the riders and their horses should appear with that search name. Select the rider/horse you want (it will highlight orange) and press the Next button at the bottom of the popup. A ‘hide’ button at the top of the list of classes will roll up the class list, so you can see the next rider and enter their classes..
Once ALL riders and horses have been entered please now assign roles – ie Team Captain, Reserve, Draft etc. This can be done using the drop down box beside the rider and horse. Note: some team competitions don't have any roles to assign. Once you have the team completed, press the next button at the bottom right of the page. There are boxes where you can put in special requests relating yarding, draw and general. You can use the general box if you want to make notes about draft riders etc. The confirm entry button at the bottom right will process the entry. There is a button bottom left which will take you back to the previous form to change entries further. You will receive an email confirmation with the entries and total fees due. Unlike the normal individual entry page, the teams and team members are saved so if you log out, they will see be there when you go back in. This is useful if you need to get one of your team members to create an account or add a different horse to their account. Classes and Roles are not saved so will need to be selected again, if you are still working on your first entry of the team. We hope you will find this a simple process but please don’t hesitate to ring 021 684858 or use the web site chat if you are having any problems. Posted by: John Lawson - Wed, Apr 5, 2017 at 10:57 PM. This article has been viewed 3957 times.